When I first designed the game system that became Panzer Grenadier, I wanted it to be universally applicable to all theaters of World War II: steppe or jungle, forest or desert, city or mountain. And with the exception of urban combat (where the system yields historically valid results, which means it’s just not usually a whole lot of fun to play), Panzer Grenadier has done that very well. And though we’ve journeyed to all of those places, and more, the core of Panzer Grenadier has been and will always be the Great Patriotic War, the titanic struggle between Nazi Germany and the Soviet Union between 1941 and 1945. Of the eighteen boxed games either now available or on their way, five of them are set on what the Germans knew as the Eastern Front. The newest of them, Gates of Leningrad, is also the first of Panzer Grenadier game set on the northern end of the main front (that is, south of Finland). It’s also the first I’ve formally handled development tasks on in a very long time, though I’ve done pretty extensive uncredited work on some series games and of course designed quite a few. As a Mike Perryman design, Gates of Leningrad landed on my desk already in pretty good condition. Mike does his homework in terms of both history and game-play, and it’s a straightforward task to turn his design into a published game. The scenario introductions and conclusions are kind of thin, so they’ll need to be bulked up, but the game play is already very clean as one would expect from an experienced scenario designer. Gates of Leningrad takes just a small slice of time (July to September 1941) to give a close look at the intense fighting that raged in front of the Hero City of the Soviet Union. German panzer spearheads clashed with Soviet defenders including crack units like 1st Tank Division, 1st NKVD Rifle Division and 1st Separate Mountain Brigade, and some not-so-crack ones like the Leningrad People’s Militia. The Germans drove to the city’s outskirts but no farther: the defenders did not yield the Cradle of the Revolution. Matt Ward and Daniel Rouleau added a new wrinkle to Panzer Grenadier games with the “battle game,” a means by which the scenarios in a chapter are tied together in terms of game play. So far that’s been pretty loose; you play the scenarios as written and then determine who won in the larger scheme of things based on objectives reached within the scenarios (winning some scenarios is more important than winning others, and sometimes how you win is even more important in the bigger picture). In Gates of Leningrad, many of the scenarios include provisions for extended play. It’s not simply a case of adding more turns to the end; if you’re trying to achieve a broader goal, you have to earn the possibility. So often the player driving the operational action (usually the German) has to achieve certain objectives to make the game go on longer and bring on additional reinforcements, withdrawals (voluntary or otherwise) and other effects. It’s a creative addition to Panzer Grenadier that players are going to enjoy, and you don’t have to play out the full battle game to use the extended-scenario rules. This isn’t our first venture into this time and place; over a decade ago at this writing Mike Perryman did a pair of small 10-scenario supplements that we called March on Leningrad and Siege of Leningrad. Siege of Leningrad’s scenarios took place well after the new game concludes; March on Leningrad had a handful of scenarios based on a couple of the same actions (Sol’tsy and Mga Station) but took a different approach with much larger playing areas. The Panzer Grenadier fanbase’s old dogs can relax; Gates of Leningrad is a totally new game. Totally. New. I designed another supplement mostly set in this area. Blue Division has been long out of print, and featured the battles of the 250th Infantry Division, a unit made up of Spanish volunteers that fought alongside the Germans. The terrain available on the maps we had in other games didn’t really suit the battles, and I found the lack of appropriate terrain frustrating. I’m looking forward to re-working those old scenarios with the new Gates of Leningrad maps so we can re-issue them someday. While there are games out there that claim to simulate “a typical action on the Eastern Front,” there actually was nothing “typical” about the Eastern Front. The Soviet Union was the largest nation on Earth, and even the relatively small portion that saw fighting during the Great Patriotic War is an enormous slice of territory. Ingria – the slice of north-western Russia south of Leningrad/St. Petersburg – is a land of swamps and forests, a very different environment than the steppes of Ukraine and adjacent lands shown in the maps from our other Eastern Front games (Fire in the Steppe, Burning Tigers, South Flank and Broken Axis). Maps from those other games don’t really work to show the fighting on the approaches to Leningrad. And so Gates of Leningrad has four brand-new maps; these are better reflective of the terrain found south of Leningrad (and also in the Baltic states). Leningrad, the Cradle of the Revolution, threw its material and human resources into the effort to repel the Hitlerite invaders. And that’s reflected in the new units included in the game, starting with the People’s Militia (the Narodnoe Opolcheniye). Leningrad formed 11 divisions of these hastily-organized troops, many of whom had both training and Red Army experience (large factories often had their own military training programs). They streamed to the front with a great deal of enthusiasm, but no so much in the way of leadership, organization or support weapons. We’ve given them their own color scheme in Panzer Grenadier, so at least they look good. Leningrad’s enthusiasm for the Communist way also required a large police presence: that love for the teaching of Marx and Lenin did not necessarily translate to reverence for Great Stalin. Many of the “Old Bolsheviks” condemned in Stalin’s show trials of the 1930’s had their power bases in Leningrad, and Stalin himself considered the city “too Western.” When the Germans approached, the NKVD – the Soviet internal security agency - mobilized its sinister forces and sent them to the front. The Germans have their own sinister forces, with Waffen SS troops fighting alongside the regular army, though not always doing so very effectively. The bulk of fighting strength on both sides rests I their regular forces, and both deploy tanks in great numbers (though most Soviet machines are older models). This is a game we needed in the Panzer Grenadier series: familiar opponents fighting in unfamiliar terrain, and sending out some unfamiliar units to do that fighting. Even better, the state of Panzer Grenadier’s design art advances, and the new extended scenarios plus battle games should provide a great deal of fun. You need this game. 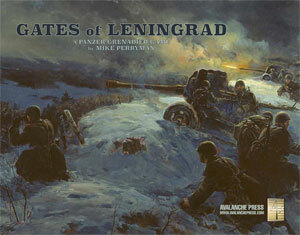 Don’t wait to put Gates of Leningrad on your game table! Join the Gold Club and find out how to get it before anyone else! Mike Bennighof is president of Avalanche Press and holds a doctorate in history from Emory University. A Fulbright Scholar and award-winning journalist, he has published over 100 books, games and articles on historical subjects. He lives in Birmingham, Alabama with his wife, three children and his dog, Leopold. Leopold approves of the Iron Dog.